The maturation of the Black Keys as record makers and performers has been both subtle and startling. Brothers is their sixth full length album but they’ve been busy lately with several other projects. 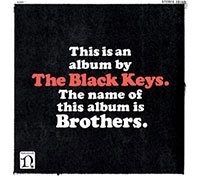 In 2009 guitarist Dan Auerbach and drummer Patrick Carney each released side project albums and they came together with 11 hip-hop artists for the amazing BlakRoc release. Brothers is going for adds May 24th and 25th.